Above you can see the map I created in class. 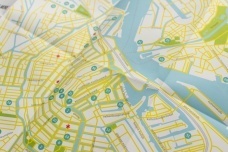 It is a collection of my favorite creative off-the-beaten-path places in Amsterdam. I created it to show people a different side of my home town. I had the map professionally printed (on eco-friendly, tear- & waterresistant mineralbased paper, to be exact) and if you would like to you can buy a copy of it in my shop. Below you can read more about the design process! ... and more. I also plan to add some space for people to add their own favorite spots in the city. I'm making the map for young, creative people who would like to explore the city from a local perspective. This was my first idea of what the visual style of the map could be. The biggest challenge I saw when starting the project was how to organize the information in a way that it is convenient for the person using it, especially on the print version. In order to be able to select the locations that would go on the map, I created a long list of about 100 places that I liked in the city. My initial list had about 50 items on it and I kept adding to the list during the time that I was working on the map. It was a good excuse to go out and explore new places during the weekend! I had been collecting city maps during the project and studying their lay-outs; what I tought was effective and why. One of the decisions that I made was to create a map that was A3 sized (something that I later adjusted to 30 x 50 cm), as this would be easy to hold in your hand and would also allow for some detail on the map itself. Then I went back to my own content (a name & an introduction, the map, photos & descriptions of the locations) and created sketches for the lay-out. In fact my very first sketch (see below) came pretty close to how the map turned out in the end, probably because I had been thinking about it for a while before I put the pen to paper. Now I realised that 100 items wouldn't fit on the map and that I only had space for about 40 items. I also wanted to give people space to add their own favorite locations in the city, leaving me with 36 locations to include on the map. From my long list, I chose my absolute favorite places and put them into different categories, like 'Coffee & cake' and 'Museums'. It turned out that almost each category had 4 items in them based on my initial selection, which as perfect for the lay-out I had sketched. So after adding and deleting just a few items, I had selected the 36 items on the map. Later on I still changed one or two items because they turned out to be too similar, but most of the initial selection stayed the same. Illustrating the map itself took by far the most time, however it was a pretty meditative task and it was nice to see all the layers coming together. I used the Open Street Map website to generate a map of the city and I traced the streets, the water, the train lines, etc. using Illustrator. Most of it was done using the pen tool. The challenging part was deciding what level of detail to include, as I didn't want to clutter the map however I also wanted to people to actually be able to use it to navigate their way around town. I tried out different colors for the map and ended up using a palette of green, blue and yellow as the main colors, as those colors are familiar to people based on other maps. On the back of the map, I wrote down short descriptions of the locations: what they were and why I liked them. I included the address and a website, in case they would move or if someone wanted to find their phone number. They were numbered and I also added the numbers on the map itself. Each location also has a photo and I took most of them during a few bike trips around town. Before printing the map I contacted each location and asked them if it was okay to use the photo (of if they wanted to send me another one, as some locations did) and if the text was correct (enabling me to change/update two address). Now that the design was almost ready to be printed I got in touch with 'De Monsterkamer', which is an amazing local resource where as a designer you can ask questions about paper & printers for your projects. Esther Krop suggested that 'Gaiakraft' paper might be a good options (as well as several other kinds of paper) and that is the paper that I ended up choosing. You kind of have to feel it to understand why I chose it: it feels mostly like paper but also a bit like plastic. It is eco-friendly, made using minerals and most importantly it is tear- and water resistant. In a rainy country like the Netherlands, those are pretty useful features for a map ;-). I contacted two excellent local printers and ended up working with Zwaan printmedia. The fun part was that I could visit the printer while they were printing the map! As I said I wanted people to be able to add their own favorite places to the map, as I couldn't possibly have found and included every creative spot in town. This was a little challenging design-wise though, as people had to be able to add a number to the map. The solution I chose was to create little stickers and glue those to the map. When the maps arrived back from the printer, I was so thrilled! It was exciting to see the results of the project I had been working on for so long! My dad helped me place them in individual plastic bags and I bought some packaging materials to be able to ship them out to people. So far I've sent out copies to people all over Europe and also to the US and each time I'm still so excited to be able to send someone the map with all my favorite places. If you'd like to buy a copy of the map, you can do that right here on my website. The map is also for sale at Athenaeum Newscentre and concept store Hear Hear, both in Amsterdam. I'm very thankful for all the encouragement and feedback I received while I was making the map and after publishing it. Both here on Skillshare, on my blog and in real life, I've felt inspired and supported along the way and that made a big difference! A very special thank you to Anne for starting and teaching this very cool map making course, giving me the inspiration to do this and for featuring my map making story on her blog! For the first exercise I created a series of handdrawn maps of Amsterdam on A6 cards. I made them for the 5 year anniversary that me and my boyfriend celebrated the other week and together they showed what we were going to do that day. All the items on the map were places that were new to us in one way or another so we explored our city in a new way. The cards were put in seperate envelopes so each of the activities was a surprise, however all the cards put together formed a complete map. To draw the cards I used Google maps as a reference and I rarely redid a drawing in order to achieve the handmade (read: imperfect) feel. It was also a good way to practice for the class project described above!